In Italy since November 2018, the CentreforVietnamStudies in Turin has prepared a series of workshops to affirm the significance of this agreement in facilitating exchange and cooperation between Vietnam and European countries by simplifying customs procedures for certain products, recognising geographical indications, and applying environmental protection standards. 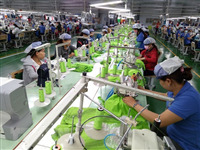 Vietnam will eliminate 65 percent of its import duties on EU items and has drawn up a roadmap to eliminate tariffs by over 99 percent over the next decade. The remaining export items will be offered tariff quotas with an import duty of 0 percent./.